And so the big day is finally here. After months of waiting, steadily rising anticipation, and not a few awkward moments, we'll see an important watershed reached today. Here at Macro Man Towers, where Mrs. Macro hails from the north of England, the house is all aflutter. Yup, Macro Boy the Younger turns 13 today, officially becoming a teenager. Anecdotally, it doesn't sound a if speculative participation in the currency market amongst professional investors is very high at all. Given the magnitude of the event, that may seem shocking, but if you think about it it's not very surprising at all. Perhaps the only consensus view surrounding the whole bloody mess is that market liquidity is going to be abysmal and that it will be very difficult to transact size, particularly if the vote is close. If you go into the referendum with a position, you have become a price taker. In other words, you're going to rely on the market to let you out of your position, either on a take profit or stop loss basis. If you need to shift any kind of size, this is going to be very problematic, particularly given the possibility of wide gaps (the market is using post-SNB CHF trading as a model here.) Lest we forget, these results are going to be coming in during Asian trading hours...8.00 am London it's not. Being a price taker, therefore, puts you at a decided disadvantage. Let's consider a stylized model of how the market will trade. We'll assume that there are two data points: an initial reading relatively early on in the proceedings, and then a final result. Each of these can point to either Remain or Leave, which gives us 4 possible combinations: RR, LL, RL, LR. The problem is that no matter whether you are long or short cable, three of the four possible outcomes will leave you with a mark to market loss at some point during the day. 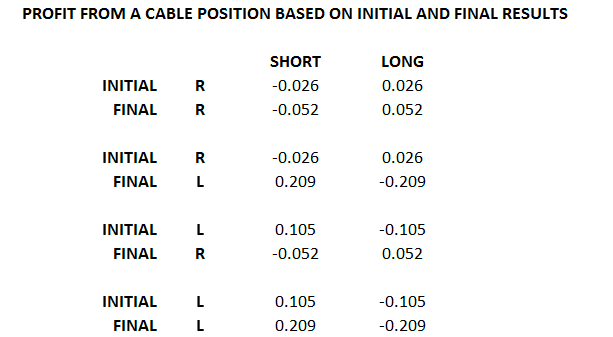 The table below sketches out the cable P/L (expressed in big figures, not percentages) based on the assumption that a) cable moves in line with the coefficients calculated in Macro Man's model, and b) that the initial result will push the Leave odds halfway towards the binary final outcome (0 or 100) from the current 20% or so. So if 3/4 of the world states will leave you with a mark top market loss at some point, AND price action will be slippy and nasty (in case you want to cut and run), where's the edge? There isn't one. Rather, in a market that is suffering from a deficit of liquidity, the edge will come in providing liquidity AFTER gappy moves. Even this will be easier said than done, of course, but leaving modest limit orders at levels where you think the outcome is fully priced (1.25 and 1.53?) won't get you into too much trouble (they may well go unfilled) yet could land a nice windfall profit. While the last published odds that Macro Man has seen put Leave at 22%, given the move in sterling since the latest polls came out it looks more like 20% from his perch. Macro Man also tried to regress the FTSE based on the the odds for Leave, but perhaps unsurprisingly the relationship was much weaker than with sterling. FWIW, the regression put each percentage point of Leave odds as worth 7.75 FTSE points; given where the odds were when the FTSE closed today, that would leave a Remain vote as being worth 3% on the index. While that feels a little low, it's probably close to the right ballpark; over the last year, there have only been six days with moves of that magnitude in either direction. A Leave vote, on the other hand, would imply a downdraft of a little more than 9%. Most readers will by now be aware of the niceties regarding reporting times by district, early turnout levels, the weather, etc. Suffice to say that information is likely to drip out from just before midnight in the UK until breakfast time tomorrow, with turnout figures published before voting results. Punters and pundits will key on turnout figures from UKIP-friendly districts as well as those (such as London) more well-disposed to remain. Having spilled so much (virtual) ink on the subject recently, Macro Man reckons he'll stop here. While it would be fun to do a live blog of the day, he has birthday commitments with MB the Younger today. Good luck, and try to have fun! So BORED of Brexit already... Let's face it, does anyone for a second believe the global elite will let the UK leave the EU? All the news frenzy is purely an excuse to allow algos to run stops before moving the markets higher. But the dips in everything ! no matter the Bremain or not the real risk for the market is hiding just behind. Expect an ugly summer. Watching and waiting. We have a lot of fun fading over-exaggerated moves, so that's what we will be waiting for. 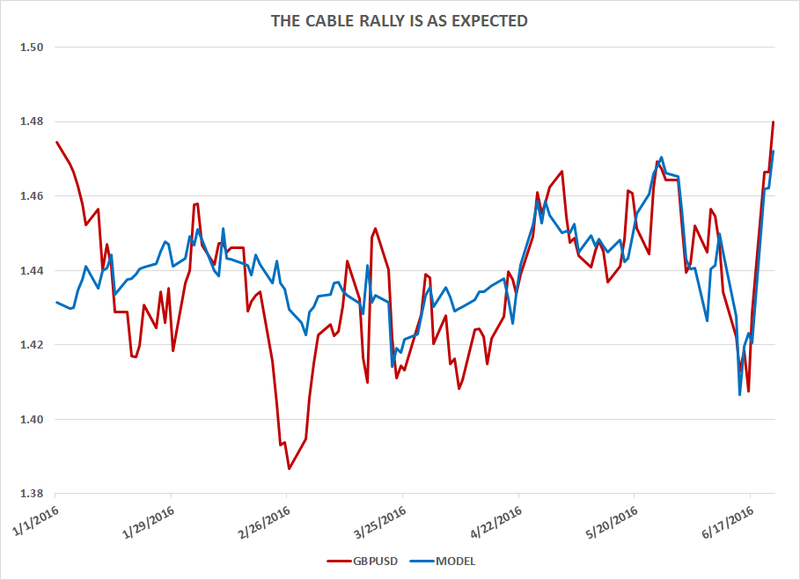 In some markets (Oil, FX) most of the exaggerated move has perhaps already occurred. $50 WTI was rejected quite strongly again today. A total crush of vol seems the most likely outcome today/tomorrow, more like a monthly than a weekly OpEx. Happy to hear a few punters did well, the sterling longs especially. The view from the Hammock™ continues to be delightful, however. VIX still at 18 here, surely that will be crushed below 14-15 again? The big washout in $DXY may be coming also. LB is also fascinated by the action in USDJPY. Waiting to short USDJPY, AUDUSD and EURUSD once again. I think that during these days some people have learned how exactly Vix is calculated and how VXX and similar product are inefficient. Let's try a thought experiment... a strong 200k+ plus ("trend growth") number on July 1st puts a Fed hike "back in play" for July and short end rates spike once again. On the 4th, PBoC fixes CNYUSD below support levels, and we all wake up to a very strong and highly patriotic DX rally on the 5th. The big punters have already wound down the Q2 Dollar Carry Trade but all the small guys are caught offside. The 2016 Commodity Rally is declared officially over and the carry trade in USD/JPY begins to unwind rapidly. Oil and energy stocks are hammered, and EMs and HY are taken down for good measure by rapid covering of dollar and yen shorts. It's quite interesting how the real credit markets are diverging from the HYG and JNK ETFs at the moment, btw, despite some signs of credit distress the ETFs are soaring. Those ETFs are just a part of what seems to be a basket carry trade at the moment (Short USD, long WTI, HYG, XLE) that has run since February. The long bond has taken a bit of a beating these last few days, but that's still going to be an attractive vehicle in the months ahead, with Europe and Japan mired in negative rates, and the US presumably still attracting capital flows from EMs. If the dollar is going to be bought in Q3-4, then the long bond would be the logical place for (fixed income) investors to go. The US yield curve flattens once more as fear trades begin to dominate in the run-up to the US election .... and after much deliberation, we have come around to the idea that a 1% US10y now makes a lot of sense, as the deflation noose tightens its hold on the neck of the global economy. Only the advent of new fiscal policy or helicopter money can reverse the trend. As someone who uses VXX and XIV to tactically manage portfolio volatility, I love political event risk. VIX tends to over react and then correct quickly. Shorting these spikes (e.g. Brexit, Greek debt crisis, etc.) have been our most profitable trades. Though we generally avoid spikes following poor economic prints/worries. Much easier than having conviction on Spoos these days. That being said, understanding the workings of the VIX futures markets that underlie the numerous VOL ETFs is step one. Most complaints about disconnects between price movement and VIX level changes stems from a general misunderstanding of the instruments themselves. NFP lottery will be held on July 8 (not July 1) and FOMC lottery will be held on July 27. So your timing needs some adjustment. Plenty of time between the two lotteries and there is the earning season. It will be interesting next month. Thanks Anon @7:49, for the correction. Yes, makes sense, for sure everyone will have left town on June 30!! YouGov exit poll released at 10 pm UK time so may be of interest. However, I will get up at 5 am to see price action in Asia, looking to fade any big moves in sterling, I think Bremain is priced in already with any exaggerated move just a trap. Happy hunting! This is better than watching Eurovision voting. As markets went decisivly remain during the day, if out actually wins there's gonna be an insane rush for exits in the morning. A day to remember maybe in a trader's career. Exactly. All the media misrepresented bookies as ppl with some sort of deeper inside knowledge. In reality their quotes only show the balance of bets put on each side.